Our story begins millions of years ago on a planet inhabited by human females in the Large Magellanic Cloud (one of two small galaxies that orbit our own Milky Way galaxy). A group of early-humans (male and female) are discovered frozen in ice at the northern region. Since this archeological find could severely upset a religious structure that once controlled the planet for thousands of annuals, the scientific team decides to keep the facts hidden at first. Eventually, they reveal the secret, only to have the religious factions start a war to take over the planet, spurring the scientific group to escape by trying a "quantum-leap" to the River of Souls (the Milky Way galaxy). 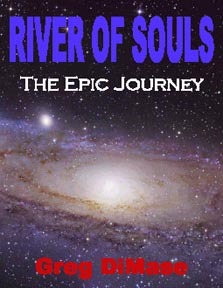 River of Souls -- The Epic Journey: Our story begins millions of years ago on a planet inhabited by human females in the Large Magellanic Cloud.